On August 2, 1996, Bob Dole's presidential campaign broke the Internet. Or at least that's what they thought they were doing. It didn't do the Dole/Kemp ticket any good, but luckily for us, it's still up for our collective enjoyment. 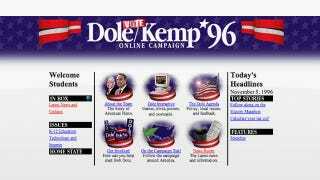 Like all websites from the 90s, the Dole/Kemp site is hopelessly tacky. The graphics and text look tiny by today's standards because it's optimized for the screen resolutions and data speeds of 1996. The Dole Web site also customizes to take each users' technical capabilities into account by offering different variations with Shockwave applications and/or RealAudio. The user is even given a layout choice by selecting from a variety of animated and non-animated "footers" for the main page. Unlike other political Web sites, the Dole campaign also offers users a mechanism to give feedback to the campaign on policy positions. Each briefing paper is an interactive document that lets users tell the campaign what priority they think a Dole administration should give the initiative.